• The new iPad mini and iPad Air come in silver, space gray and gold finishes in 64GB and 256GB configurations. 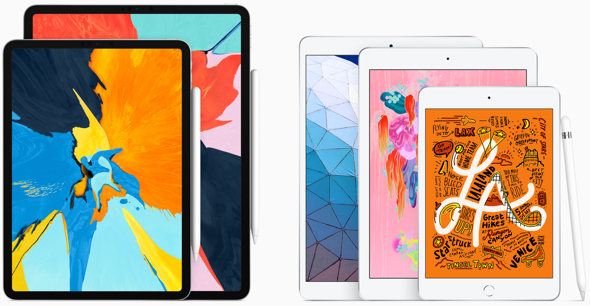 The new iPad mini starts at $399 (US) for the Wi-Fi model and $529 (US) for the Wi-Fi + Cellular model and the 10.5-inch iPad Air starts at $499 (US) for the Wi-Fi model and $629 (US) for the Wi-Fi + Cellular model from apple.com, in the Apple Store app and Apple Stores, and is also available through Apple Authorized Resellers and select carriers (prices may vary). • The new iPad models are available to order starting today from apple.com and in the Apple Store app in Australia, Austria, Belgium, Canada, Czech Republic, Denmark, Finland, France, Germany, Hong Kong, Hungary, Ireland, Italy, Japan, Luxembourg, Netherlands, New Zealand, Norway, Poland, Portugal, Singapore, Spain, Sweden, Switzerland, the UAE, UK and US. Starting next week, the new iPad models will be available in those countries and regions, as well as in China (Wi-Fi models only), Macau (Wi-Fi models only) and Mexico with more countries and regions to follow soon, including Colombia, Greece, India, Israel, Russia, Saudi Arabia, South Africa, Thailand (Wi-Fi models only) and Turkey. 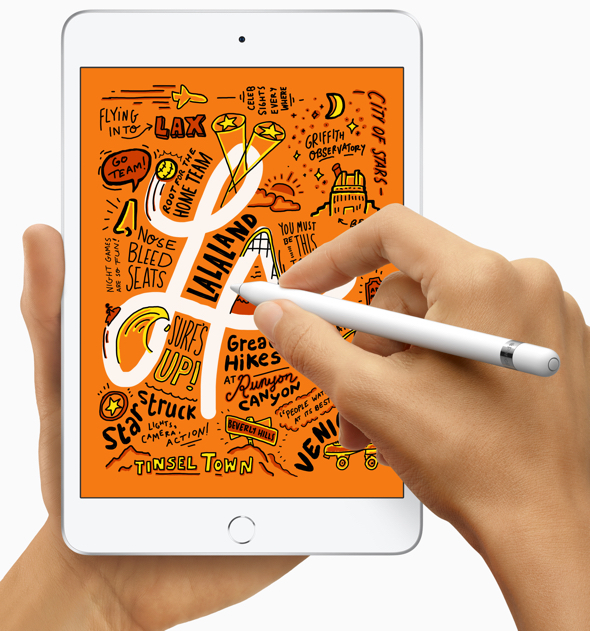 • Apple Pencil (1st generation) is available for purchase separately for $99 (US). The Smart Keyboard for the 10.5-inch iPad Air is available for purchase separately for $159 (US) with layouts for over 30 languages, including simplified Chinese, French, German, Japanese and Spanish. • Polyurethane Smart Covers are available for $39 (US) for iPad mini and $49 (US) for iPad Air in charcoal gray, white, pink sand and a new papaya, with additional Leather Smart Covers available for iPad Air for $69 (US) in black, saddle brown, midnight blue and red. • Trade in your eligible device for credit toward your next purchase, or get an Apple Store Gift Card you can use any time.7 If your device isn’t eligible for credit, Apple will recycle it for free. 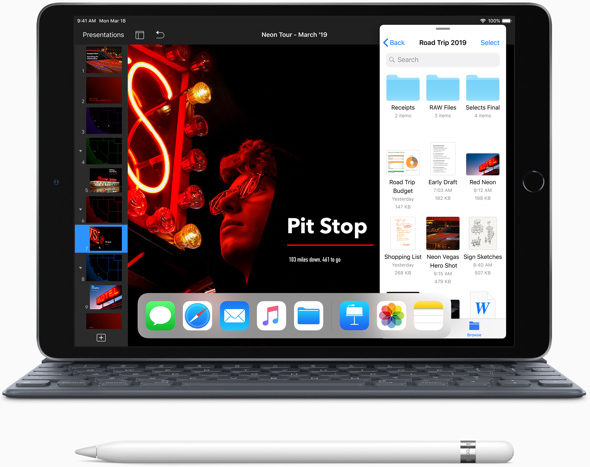 • Every customer who buys iPad from Apple can enjoy free Personal Setup in-store or online, and receive guidance on how to customize their iPad, set up email, find new apps from the App Store and more. • Anyone who wants to learn more or go further with iPad or iOS 12 can sign up for free Today at Apple sessions at apple.com/today. MacDailyNews Take: Both of these new iPads are going to be extremely fast (A12 Bionic!) and future-proof. Especially in the 256 GB versions, expect to get many years out of them! Pencil support was unexpected and a nice touch. Overall, a pleasant surprise indeed! Yes, I agree, but also wonder why Apple keeps pushing their old hardware on customers buying their new devices? I bought an iPad 6 at some point and would definitely buy an Apple Pencil, but won’t buy one that I can’t also use on an iPad Pro. It seems like a marketing ploy to cause me to buy two pencils and that makes me to feel a bit sleighted and think the move is greedy. Does anybody know of another reason so I can calm down? LOL! You cannot use Apple Pencil (2nd generation) with these iPad models. What does this “cannot use” even mean? I know that the main stopper for using 2nd gen pencil with older iPads is that the only device currently for charging it is the new iPad Pro. Assuming one has a new iPad Pro and a new 2nd gen pencil, is there any real compatibility issue with older devices (or now new iPad Airs? My mini3 has gotten so sluggish of late. I used to use it all the time, but of late my xs Max has taken over. I’ll be in line for a new iPad. Not exactly stunned that the overhangs are as old school as ever but it might be enough to finally replace my 3rd gen after holding out for a long time but will have to check them out fully before deciding. As we know with Cook its either now or at least 2 years (and probably more) before anything better will land and the Pro is just overlook for me while the 3 will probably die of exhaustion by then, me too probably waiting for it to respond to input. Mac users — aren’t you happy knowing that it only took 5 years for Apple to update its iPad Mini? This is Pipeline Cook’s legacy. It runs iOS which is always a trial for a Mac user. My old iPad Air works for reading the news. It probably has some life in it yet. Me and my wife has both iPad mini 4 with WIFI and cellular. I use mine for reading books and other things that will be too small on my on my iPhone 8. When she is home she puts her iPhone XR down and does everything with her iPad. The size is perfect to carry around everywhere. The new one will be a great one for us.